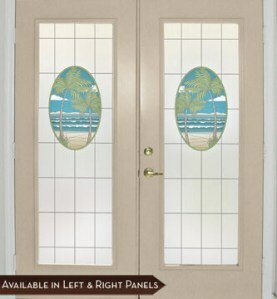 Updated August 2013 – We’re bringing the tropics to you with our new Island Oasis Door Panel and Island Oasis Centerpiece design that combines palm trees, the ocean and beach imagery to create an idyllic stained glass tropical paradise for your home or business. 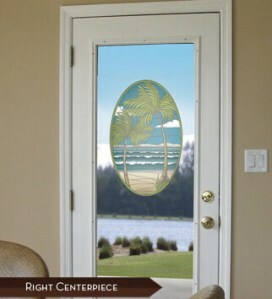 Island Oasis is available as full door panels in see-thru and privacy versions (3 sizes) and a decorative accent centerpiece (4 sizes) that are great of doors or windows. 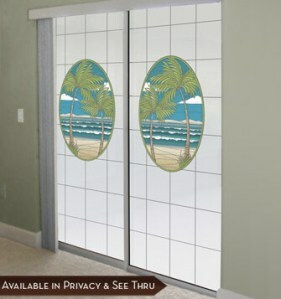 Mirror images of each design are available for decorating double doors or windows. That way each door has a coordinated, custom look. The privacy version combines our Lite Frost with a leading line grid which joins with the artwork. The lite frost obscures visibility to improve privacy and security without darkening the room. The see-thru version features a leading line grid which joins with the artwork. It allows great visibility through the glass, plus provides the added benefits of UV protection and energy savings. As with all of our window films, these new designs apply in minutes and will look great for years. Plus, they remove easily and cleanly when it is time to redecorate! Make the project even easier with the trim-to-size service offered by Wallpaper For Windows. The film is cut to size before shipping. When the Wallpaper For Windows arrives, the film is ready to be applied to the glass. 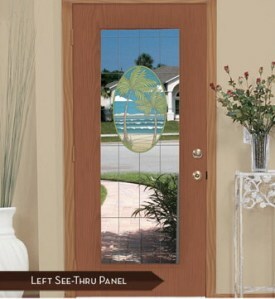 In minutes, your window or door will have a beautiful, custom look. This entry was posted by Design Team on April 26, 2012 at 9:37 am, and is filed under Decorate Glass Doors, Decorate Windows, Glass Storm Doors, Sliding Glass Doors, Window Film Basics. Follow any responses to this post through RSS 2.0.Both comments and pings are currently closed.